In my last post here at Writer Unboxed, I mentioned that – despite what the “build a platform” drones might chant outside your bedroom window at night – writers don’t have to be on Twitter. It is not required. Believe it or not, we are all grown-up people here (or let’s pretend we are), and we have the right to pick and choose which things we participate in. Shocking, right? I resisted the siren call of Twitter for years. Everyone and their dog was talking about how it’s so much better than Facebook, but I’ll admit I have an obstinate streak, and the sheer volume of “You should be on Twitter” comments had me vowing I would never touch the thing. To be honest with you, I feel silly for taking that stance for that reason. There are many reasons for writers not to use Twitter, but sheer stubbornness is surely the least valid. Needless to say, since I write an entire column about it, that I am now decidedly on Team Twitter. But don’t get me wrong. I’m on Team Twitter because it’s turned out to be a fantastic “fit” for me, but that doesn’t mean I can’t see that it’s a horrible fit for others, or that it has drawbacks. I have several friends who used Twitter for years before deleting their accounts – and as far as I know, they couldn’t be happier with their decision to jump ship. This post is for those of you who haven’t made up your minds yet. Maybe your writing buddies are trying to talk you into it but you have reservations. Maybe you want to try but feel intimidated. Maybe you have an account you never use and are wondering if you should delete it. Maybe you’re already active and secretly loathing it, wishing you could cut it out of your life. No matter where you stand on the scale of undecided, a nice old-fashioned pros and cons list is always helpful! It’s one of the best ways to learn about the writing/book industry in real time. You can follow agents and editors for inside tips. Professionals share insights on Twitter that they simply don’t share anywhere else. If you’re querying or on submission, you can get a much better feel for agent/editor personalities (so you don’t end up with someone you don’t mesh with, or worse, don’t respect the way they handle themselves or their clients). There are plenty of opportunities to learn about the craft of writing. It’s a great place to ask questions and (usually) get answers. Connect with other writers and build a support network. It can actually help teach you brevity with your prose. Expand the reach of your blog. Find more blogs to follow. Keep your finger on the pulse of the industry. It can be too fun. (Read: distracting.) If you already have trouble making yourself focus on your writing, Twitter becomes another temptation. Twitter is a confusing place at first. It takes a serious commitment to learn the ropes. Using it as a self-promoting machine is a waste of time. Twitter is for interacting with humans and building connections, not constantly advertising your book. If that’s all you’re interested in, your efforts will be better spent elsewhere. If you hate shortening your thoughts, you’ll be miserable. If you’re impatient with annoying people, you will be irritated often. Doing Twitter well takes time. If you don’t have any time to dedicate to learning the ropes and maintaining a presence, you likely won’t get much out of it. If you already have a grudge and/or have no interest in Twitter, you might not be able to give it a fair chance – self-fulfilling prophecy and all. If you’re content with your other platforms, Twitter might not add anything. If you struggle with self-esteem as a writer, Twitter can be a dangerous place laden with comparisons, number-mongering, and cliques. If you’ve given it the old college try and still felt miserable, why put yourself through that? There are plenty of other options! There are more factors, of course. One important aspect that I don’t think anyone can predict is that indefinable “click” factor. Twitter truly does have a culture all its own, and like any culture, it may or may not be for you. I never thought I’d like Twitter, but once I’d been on it a few weeks and really got the hang of it, I was hooked. Maybe you will be too. You never know until you try! Are you struggling with a decision about Twitter? Or if you’ve already made up your mind, what are some pros and cons you can add to the lists for those who are undecided? Twitter and I’ve found it to be a great resource. Twitter is a great place to practice the Law of Attraction. See if you can draw people to you, just for the fun of it and not as a necessity. Can you hook people with some cool one liners? Oh no, “YOUNG” Padawan is perfect. Bahahahahaha!!!!! I’m a Twitter newbie and love all your posts about it. I’m glad I joined because I’m able to connect with other writers that I can’t reach with my blog, which is pretty popular. The thing I struggle with for Twitter and Facebook is that I work full-time and just can’t get on there much if all during the day while I’m at work. So I miss a lot. I have to spend a lot of time reading blogs to keep my following so it’s a struggle finding time for it all and to write since work takes up so much of the day. Not sure there’s an answer to that problem. Thank you, Natalie! I know what you mean; whenever I end up missing a lot of Twitter time I feel pretty overwhelmed trying to “catch up.” I think you’re right that there’s not much to do about that particular problem. You only have as much time as you have, you know? But I do have 2 tips that might help you keep from getting overwhelmed like I have before. 1) I allow myself to “miss things.” If I can’t get on Twitter for 3 days, I don’t try to read all I missed during those 3 days. I just start where we are now, and it’s much less stressful. 2) If I do feel the need to “catch up,” I only look at my private Twitter list called “Favorites.” These are my top tweeters – the people who consistently offer good content without clutter. That way I know I’m getting the good stuff without having to wade back through everyone. Maybe one/both of those will help take the edge off! Thanks for the tips. I do have favorite lists and I do try to focus on them. And yes, I just can’t worry about catching up. There’s too much being tweeted or posted on Facebook. Have you tried Hoot Suite? I am new to it, so I cannot explain all its abilities, but it manages all your social media in one place and allows you to space out posts/Tweets. I go to Hoot Suite in the morning and write a few FB posts (which also go to Twitter) but schedule them for various times throughout the day. This way you don’t have to login to Twitter at all if you don’t want to. When you go back to HootSuite later in the day, you see your most recent Tweets and Posts. Maybe you should look into it. Oh, thank you for pointing that out, Liz! I don’t use any outside Twitter apps, so I often forget to mention them. I believe there are several different services that allow you to pre-schedule tweets. My only word of caution with that: they will be posted regardless of what’s going on in the world, which sometimes backfires. For example, when national (or international) tragedies of large scope hit, self-promotion tweets look extra tacky. So if you do auto-schedule, be sure you’ll have enough access to go in and cancel them at times like this! I’ve been on Twitter for three years, and I do love it for all the reasons you mention. BUT, I totally agree with this, too: “Twitter can be a dangerous place laden with comparisons, number-mongering, and cliques.” When that less savory side creeps in more than I’m comfortable with, I do take a break, and luckily (as you say) there are plenty of other options of things to do! We’ve all experienced that, I think. I take breaks too! And I focus on interacting more with positive people – like you, Julia – who help stave off those negative tweeters. And if someone regularly makes me feel bad, I unfollow them! Thanks for your comment. Annie, I’m with you all the way. I resisted Twitter for a long time until a colleague explained how it really works and the sharing culture. Now I’m hooked for all the reasons you cited. My own lesson learned is that I did not take the time initially to learn all of the techniques t get the most out of it. Thanks for a great post. “Sharing culture” is a fantastic phrase for it! That’s exactly how Twitter works. And I agree – many people who I see give up simply don’t give it a full chance. You have to work to learn the ropes before you can truly tell if it will work for you or not. Thanks CG! I too resisted Twitter for years. But once I took the time to really give it a chance I realized it’s the best social media platform for me and the way I relate online. Thanks for breaking it down so clearly! Annie, like so many authors I’m on Twitter because I’m afraid not to be–you know, the “they’ll get ahead of me” situation. But you hit the nail on the head–with me, at least–when you said it can be a problem “if you struggle with self-esteem as a writer.” Don’t all of us, beneath our veneer, suffer from the Imposter Syndrome? When I find Twitter (or Facebook or a writer’s loop) bringing that to the fore, I step back, read some of my reviews, and try to move on. Thanks for a thorough and helpful presentation of the pros and cons of this medium. Richard, I know exactly what you mean. I can’t speak to all writers, but I know I definitely go through bouts of self-doubt. I think it’s always best to step back at those times. Something I didn’t directly mention, though, is that Twitter can also be a great place to build a positive support system that actually boosts your self-esteem. It’s all about who you follow and how you interact. Worth some thought! I’ve been a twitter head for about a year. Rarely do I run into unkind people. It has been a great place for me to connect with other writers and bloggers. I’ve even made in person friends, interviewed interesting people and recruited guest posts for my site all from twitter. I completely agree, however, the pitfalls are wasting time by getting lost in twitter land and unrealistic marketing expectations. Good post! Thank you, Greta! If you’ve never run into anyone unkind, you’re doing a fantastic job of following the right people! Good for you. I also think a positive attitude sets the stage for like-minded people to follow your lead. Thanks so much for the comment. I, too, was a long-standing holdout on Twitter and other social media outlets; in fact, I only really started testing out such venues about six months ago. I found that I simply could not get into Facebook, but Twitter I like. It’s sort of like a mini news feed: a series of snippets about current events, items of interest to me as an author, and a surprising number of clever remarks that I wish I’d come up with myself. What surprised me about it most was that you really do get a sense of who a person is by following their tweets – it’s a funky sort of connection, but real nonetheless. I do, however, wonder sometimes about how the programming actually works on Twitter’s end. For example, I never see tweets anymore from people I started following early on – like, never. I understand that as I follow more people, individual tweets are going to be more spread out, but it really seems as if my tweetstream is biased towards my newer following. Anyone else get that impression? Hi Lori! I would be shocked to learn that Twitter is weighing the timeline. Facebook pulls those types of shenanigans all the time, but I’ve never known Twitter to. A few thoughts come to mind. You might look at the personal timeline of one of these disappearing people. Check out the last few times they tweeted, then go back to your main timeline and scroll through to see if those tweets were included. Chances are that they were. It seems more likely to me that these people simply aren’t tweeting as often as they used to, or perhaps that the newest people you’ve followed tweet much more – making it easier to miss the originals’ tweets while you’re scrolling through. If that’s the case, you might make a private Twitter list for those “quieter” people. That way you can occasionally look at that timeline so you don’t miss important but spread-out tweets in the general “noise” of a full timeline. I’m glad you’ve found Twitter to be a good fit! I agree that although it’s a different type of interaction, it’s most often genuine and (in my experience) heartfelt. Thanks for stopping by, and happy tweeting! Great job laying it out, Annie. I have a presence on Twitter, and I think it’s important. But I rarely tweet. I feel like I understand how it all works (#NotATotalNewb), but a couple of things keep me from trying to become more involved (I have tried, several times, for extended periods). First, my gig on the WU fb page keeps me fairly closely tied to fb. If I’m going to check a social media platform during the day, it’s going to be fb. Also, I’ve always felt a bit overwhelmed by Twitter. Those tweets just keep flying by. Sort of like the old Bobby Goldsboro song: “Everybody’s talkin’ at me, I don’t hear a word they’re sayin’.” I tried Tweetdeck (but not Hootsuite), and it didn’t seem to help with the feeling, and may have made it worse. Everyone talks about “connecting” on Twitter, but for me it feels decidedly non-connective. I’m sure it’s just that I’ve never properly immersed myself, but it seems so much more geared to talking than listening. And the listening (as someone mentioned above) feels sort of like eavesdropping at a cocktail party–on people who are hoping to be overheard while they talk. Just my take. And it’s as you perfectly outlined: I realized about a year ago that I have a choice. I was forcing myself to tweet every day, and it was drudgery. So I stopped. I occasionally tweet into the ether (not sure why, since I’m not “connecting” with anyone). Usually it’s to support someone else. I receive emails when someone mentions me, and I always respond. And that might just be it. For now. Having said all of that, I’ve made some wonderful connections online, and some very dear friends in the writing world. Being connected online has changed my writing life, in a powerful way, for the better. And Twitter has had almost nothing to do with it. So anyone who’s feeling like they have to force themselves to participate, take it from me. It’s not necessary. Vaughn, I hear you! I think most writers have one go-to platform they use most often. I don’t think there’s anything wrong with that. As you said, yours is Facebook and it has served you well – mission accomplished! That said, I have a couple of thoughts that might help you on the Twitter side of things. I’m not a fan of any of the outside apps like TweetDeck, but one thing that really helps me avoid being overwhelmed by my timeline is utilizing lists! I have two very important (but private) lists that I couldn’t live without: “Filtered” and “Favorites.” Filtered is everyone I follow minus the clutterers: people who tweet way too often, people who over-promote, people who never interact, etc. This is what I usually look at instead of my main timeline. And if I’m in a hurry or trying to catch up, I look at my even more pared-down Favorites list: only those tweeps who consistently offer good content, no clutter, and real interactions. So using lists is my best tip for wading through the muck. My best tip for getting more real interactions out of Twitter is to put more real interactions into Twitter! Like anything else, your participation and attitude really do set the stage. It might feel like awkward conversation-crashing at first, but jumping in is expected on Twitter, and the more you do it the more you’ll notice people reciprocating. That’s quite the compliment!! Thank you, Vaughn! account) it’s not as important. This is a big problem! My solution is the use of “filtered” and “favorites” lists. Check out my reply to Vaughn above for more details! Fascinating conversation. I have started Twitter recently. well, but the entry is a bit daunting. I’ve heard that, if you want to reach the younger crowd, twitter is where they hang out. Facebook has been overrun by old-timers like me, so our kids are leaving in droves. I use twitter, but honestly, I hate it. It’s too much coming too fast. I should probably use it to just follow a few people in the publishing industry. I see the use in that. I like one writer’s advice: pick on social network that you enjoy and do it well. Othewise, we’re spending more time trying to keep up with all our accounts and less time writing (which, I hear, is still a component of being a writer). Hi Ron! I’m not sure it’s quite as clear-cut as “young” and “old,” but there are absolutely different ‘vibes’ on Twitter and Facebook. If you hate Twitter, it really will become a waste of time! I whole-heartedly agree with the advice to choose one or two and use them well. That said, if your main problem with Twitter is the “too much too fast,” you might check out my tip to Vaughn in the comment above. Good luck, and thanks for the comment! That’s so true, Marlene! I see opportunities pop up on the spur of the moment on Twitter all the time – seemingly unplanned and unannounced – and if we’re not there, we can’t know about it. Of course, that’s true of everything, and no one can be everywhere at once, but it does seem to me that Twitter has a high rate of unique opportunities for writers. I find it well worth my time! a positive experience. Flapping over to follow you, now!! As an author in search of a publisher, I found Twitter to be a very useful tool. Glad to hear it! I have too. I’ve always had the easiest time of gaining followers on Twitter than any other social media platform. I think it’s because it is not as much of a commitment to click the follow button there as it is to follow a blog or like a Facebook page. Also, on Twitter your tweets get as much attention as anyone else’s (based on how much the person wants to see them). On Facebook I firmly believe my author page posts are often lost with the administrations structuring of who gets to see what. It’s also been easier on Twitter to get to know people outside of the novel writer groups. I’ve gotten to follow (and be followed by) other creative types such as photographers, poets, painters, & musicians, as well as nerds, geeks, Shakespeare and superhero fans. :) Most are readers as well, and they like the same things I do, which means they might like my books/stories – and we get along well! I’ve done some twitter interviews, and that’s been a lot of fun. Interacting with people on real-time is pretty cool, too. I was like you – very reluctant to get on twitter, but did because Nina Badzin empowered me to (and then was my first follower!) I drifted away for a bit, but returned last summer/fall and have really re-found the enjoyment in it. Lara, I totally agree with you as to who gets to see what. Facebook only shows my “page” posts to some of the people who follow me, and that drives me crazy! On Twitter, every tweet goes past everyone who follows you. And yes, hitting “follow” is much less of a commitment on Twitter than on other networks! Following a nice variety of people is one of my favorite things about Twitter. I love finding people who like what I like and people who introduce me to new things. Plus, finding people who like the types of things you create is smart, and a fun challenge. ironically, I’m off to tweet this. Really? Yes. I am. I’m so sorry to hear that, Sarah, but I totally understand. I hope that you reach a better place with it soon, whether that be by getting off Twitter or finding your groove. Best of luck! I have issues with the “instantaneousness” of Twitter. I’m an English-speaker in a time zone that puts me pretty much diametrically opposite, geography-wise, from other English-speakers. While they’re fast asleep is when I’m on. And I’m catching my Eight when they’re all active and interesting. It’s hard to participate in conversations when one’s twelve hours out of sync. Alas. I can’t imagine how frustrating it must be to live on a schedule opposite those you’re trying to interact with! =/ Aren’t there other English-speakers in your time zone? 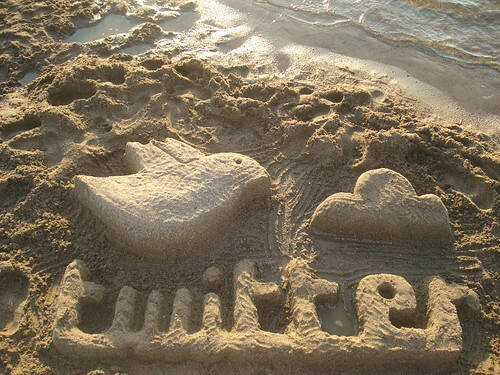 I have a love and hate relationship with Twitter (been on it for years now – I don’t even remember when I started!!) My biggest gripe: it’s a time-gobbler…If one can resist the siren call, then it’s fine. Like everything on the Net, you need strong muscles to stay away from your computer or your mobile device! I was a twitter sceptic before I started, but in terms of getting my blog noticed and finding other blogs it’s been great. Also I’m following some interetsing / amusing people. If your treating it as just a way to seel books, forget it. The ‘buy me. buy me’, I don’t think gets you anywhere. Personnally I unfollow people if I get too much of that. I also agree that it can become a distraction! I agree on all points! I follow some wonderfully funny/smart/interesting people, and I’ve found many great blogs and readers on Twitter too. I have low patience for non-stop self-promo, as do most people, I think. Like Annie, I was reticent about Twitter at first – mainly because I was tired of hearing about it, but also because I tend to be wordy and the 140-character limit sounded just awful… But I joined and started loving it once I learned the ropes. I don’t have thousands of followers and I can’t say it’s helped my career (yet), but I have made connections that I feel are valuable: new blogs to read, writers and publishers that share good tips and advice, and some charming conversations with my favorite authors. If you’re willing to commit a little, the education and access you gain are well worth it! Daily limits is a great idea. I’m so glad you’ve found Twitter worth it! I really have too; I can’t imagine learning much of what I’ve learned or making the connections I’ve made if it weren’t for Twitter. That alone seems worth it to me! Twitter is useless for self promotion and driving traffic to your blog. Yes, you’ll see a spike in traffic for a day after tweeting your most recent post, but that’s about it. What Twitter does well is create relationships. You can target people with similar interests and gain relationships rather easy. Michael, I actually find Twitter to be fantastic for driving traffic to my blog, but I agree that Twitter is all about relationships. Perhaps that’s why I get traffic; I make real connections and we end up “following” each other elsewhere, too.